Designer Tom Piper, who laid out the Tower of London poppy memorial, has spoken of his surprise and emotion at the public’s response to the artwork. He said: ‘It was a wonderful thing to see it finished. I found it very moving. To think one poppy is one life and to see the sheer numbers that are there is still emotionally draining. Thousands of volunteers will now remove the 888,246 poppies, created by ceramic artist Paul Cummins and arranged by Piper in the Tower of London’s moat. Two elements of the memorial – the Weeping Window cascade of poppies from a window and a group entitled the Wave, will remain until the end of the month. The two huge poppy structures will then tour the UK for four years before being installed at the Imperial War Museums in London and Manchester. 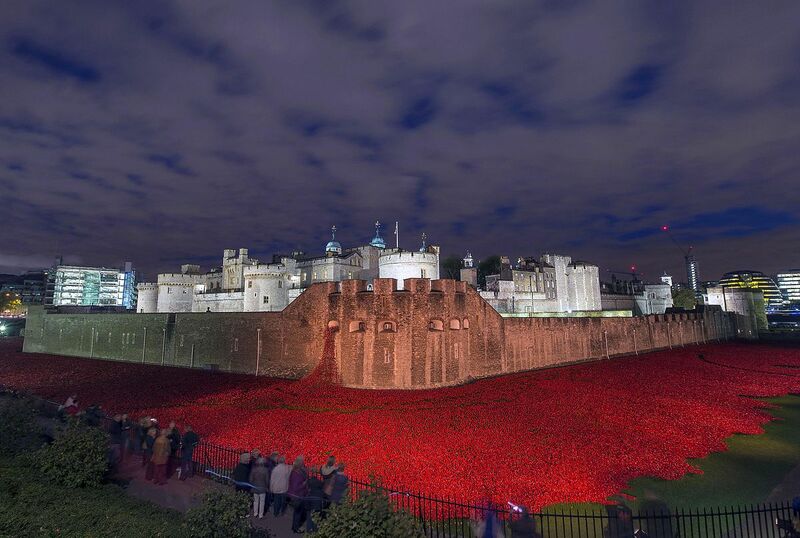 This entry was posted in News and tagged 11 November, Moat Tower of London, Paul Cummins, poppies, remembrance, Tom Piper, Tower of London. Bookmark the permalink. A wonderful tribute for Remembrance Day! Thanks for sharing. A wonderful tribute for Remembrance Day!